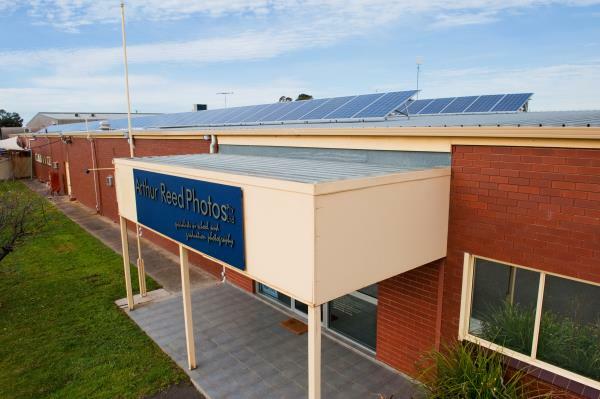 A City to Surf Solar+ installation on the top of Arthur Reed Photos' Grovedale premises. Locally owned and operated City to Surf Solar+ specialises in large solar power systems. Using only high-quality products, the businesses own experienced, Clean Energy Council-accredited staff carry out all installations. City to Surf Solar+ has installed more than 900 systems on residential, commercial, school and community buildings. Given the high cost of electricity for small businesses, solar power systems and LED lighting upgrades can dramatically bills to enhance profits. The new $20,000 instant asset write-off announced in the recent federal budget makes now the best time to install solar power. “Now small businesses receive double the benefit from a PV system – immediate tax savings from the instant asset write-off and long-term savings on their electricity bills,” says City to Surf Solar+ director Christian Pritchett. “If you’ve been thinking about solar for your business but haven’t been able to make a decision there’s really is no better incentive than this. As one of the only locally-operated installers catering specifically to the region, City to Surf Solar+ provides excellent customer service and takes care of all paperwork to make the whole process as simple as possible. Prospective clients can inspect live systems in action at the business’s showroom at 3/34 Essington St, Grovedale, by arranging an appointment on 1300 348 847. More information is available at citytosurfsolar.com.au.